As I'm sure you've figured out by now, I LOVE butterflies. 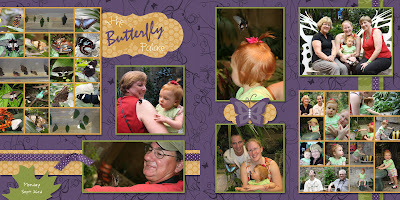 So is it any surprise that when we were in Branson I insisted we visit The Butterfly Palace? We took so many pictures of the beautiful butterflies that I didn't know how to fit them all on this page. So, of course I turned to some layout magazines I have for inspiration and found the small tile idea and from there this page took flight (pun intended :) ). The background paper for this page is actually from the cottage wall DSP. There is a very similar page that is all in green tones- which using PSE I was able to turn into an overlay. Neat right? Without getting into to many details, the trick is to make the swirls and butterflies black and then delete out the lighter green background, save as a .png and you have a homemade stamp! Can you imagine the endless possibilities! On the right-hand page I created the butterfly embellishment by using a purple punch with a lighter purple butterfly stamped on top of it. It is the best way I have found to give my butterfly bunches "ears". Hope this page gives you inspiration for you "need to fit it all in" layouts, and remember to flutterby again soon!